Most of the various sound bar systems that I have reviewed over the last five years sport a similar form factor, a long enclosure of speakers that you sit below your TV screen and, in the fuller bodied kits, a separate powered subwoofer, ideally wireless. Though the Sony HT-CT770 fits this description to a tee, its sound quality sets it apart from many of its competitors in the ever more crowded sound bar arena. Simply, the aural output is audacious from this slender 40-inch sound bar and down-firing subwoofer. Not only is the volume impressive from this 330W unit, more importantly, the clarity from the 2-way, 4-speaker design is pristine even when the volume is cranked to the max. This Sony also supplies the necessary wired and wireless connections to configure this sound bar as the hub of your room's audio system for your TV and all your Bluetooth enabled devices. 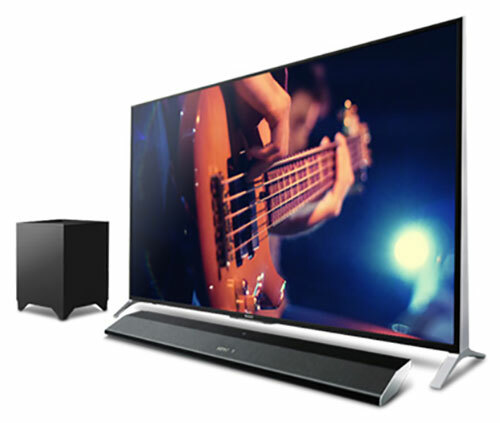 The HT-CT770 is a great, convenient alternative when you don't need a full-fledged 5.1 or larger home theater outfit. 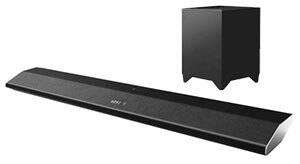 You can find lesser priced 2.1 sound bar systems than this $450 HT-CT770, (including the not as brawny Sony $350 HT-CT370), but for comparison, Sony recently released the 7.1 channel HT-ST7 for $1300. The quality and flexibility of HT-CT770 makes it a good mid-priced option. I'm glad to see these lower profiled sound bars like the HT-CT770 because you can sit them in front of most TVs and the bar will not block the TV's IR receiver for the remote control. If you do decide to mount the unit, (wall mounting brackets are included), the sound bar contains "a gyro sensor built into the audio processor that can detect what position the speaker is in and in turn adjust the frequency curve to deliver the best sound at that specific position." Underneath the sound bar's black mesh cover are two mid-range speakers plus two tweeters. The unit connects wirelessly to a powered 120W matte black subwoofer. The two are paired out of the box. Of course, the subwoofer still needs to be plugged in to a wall outlet for power. On the front center of the sound bar, the blue display shines through the mesh. Above it is a small N mark, which you tap with your NFC (Near Field Communication) device to establish a wireless connection to the HT-CT770. At the very top of the bar is a panel with buttons for Power/Standby, Input, Pairing, and Volume. 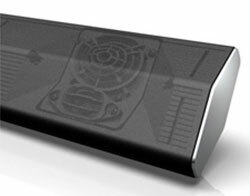 On the back is a connection panel with one Analog Audio In (3.5mm stereo mini-jack), one Digital Audio (Optical) In, three HDMI inputs and one HDMI output. With this assortment, you can connect three HDMI sources like a set top box, a gaming unit and a Blu-ray player. The audio will be captured and played by the sound bar and the video (including 3D and 4K) will be transmitted to the TV through the HDMI Out, which is ARC (Audio Return Channel) compatible. The ARC ability is important because it allows audio to move both ways between the TV and sound bar with one HDMI cable. For example, if you have a Netflix app on your TV, the sound can be routed from the TV to your sound bar. The sound bar is also Bluetooth 3.0 compatible, which enables streaming music from your paired Bluetooth smartphones and tablets. The recommended maximum distance between Bluetooth devices is about 30 feet. The palm-sized (2" x 6"), non-backlit, matte black remote control supplies separate sound bar and subwoofer volume buttons as well as a host of convenient dedicated ones for selecting Input sources and the seven Sound Field options. If the bar's blue display is too bright, you can dim it or turn it off with the Display button. For even more controls, The Amp Menu button opens up seven submenus like Level, Tone and Bluetooth, where you can make more detailed adjustments. If you plan to explore the Amp Menu choices, I suggest that you take a few minutes to read the manual. Sony also offers "SongPal" a free app (Google Play or Apple Store) for your smartphone or tablet that operates the HT-CT770 and wirelessly streams various music sources to the sound bar. I downloaded it on to an Android phone and I think the interface, which is still a bit buggy, would be easier to navigate on a tablet. Of note, SongPal needs iOS6 therefore it will not work on first generation iPads. Because the HT-CT770 is only a couple of inches tall, setting it in front of most TVs placed on a stand is possible. As for locating the wireless subwoofer, Sony does not recommend a maximum distance between the subwoofer and the sound bar. But if the range is similar to other wireless setups, no farther than 30 feet is prudent, even less if you are hiding the subwoofer behind a couch. The subwoofer should be paired with the sound bar out of the box. If they get decoupled, the manual explains how to re-pair them. The best method of connecting the TV to the sound bar is with an HDMI cable, especially if the TV has an ARC compatible HDMI input. Or if you decide to attach all the HDMI sources (set top box, etc.) directly to the TV, you could run the audio out of the TV to the sound bar with an optical digital audio cable. Once you have settled on a method, you can proceed in wirelessly pairing any Bluetooth compatible phones or tablets to the sound bar allowing you to stream music through this Sony's sweet sounding system. I use the term full-bodied a lot when reviewing audio equipment. I'm listening to hear if the full audio range, from deep lows to midtones to the upper register are well represented. Often the bass will be too overwhelmingly boomy or the high notes will be too bright. With the Sony HT-CT770, the balance sounds right. Of course, if you want to pump the low end, you can turn up the subwoofer volume or you can accentuate the higher end by adjusting the sound bar volume. I found that both units perform admirably at floor rumbling and ear plug levels. Sony does not furnish an equalizer, but you can go into the Tone submenu of the Amp Menu and tweak Treble and Bass levels. The remote also has buttons for seven Sound Fields (Clearaudio+, Standard, Movie, Sports, Game, Music, Portable Audio). The manual gives basic descriptions, but I would suggest that you sample them to hear which works for you with different content. For more options, push the Voice button and you can step through three Types. Type1 is Standard, Type2 stresses the dialog and Type3 also stresses the dialog, especially boosting "the parts of the range difficult to be discerned by the elderly." This kit does not include satellite speakers and therefore the 2.1 sound bar system cannot really recreate the true surround sound experience. The HT-CT770's output is clean and well defined, just don't expect to hear the chop chop of helicopter blades approaching from behind you. 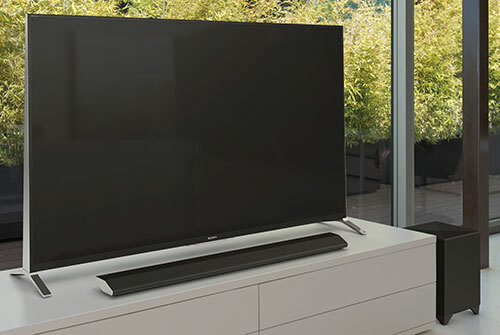 At its MSRP of $449, the Sony HT-CT770 is more expensive than other 2.1 sound bars in the marketplace, but its audio quality and numerous connection options justify the premium. ( If you have a smaller room, you could consider the less powerful,$350 Sony HT-CT370. Also Sony had a limited time special on the HT-CT770 for $399. If you are patient and vigilant, you may find that bargain pop up again. If you are really hankering for a 5.1 sound bar unit with satellite surround speakers, then look elsewhere. With a powerful wireless subwoofer and a vibrant 2-way, 4-speaker sound bar, the Sony HT-CT770 produces full-bodied audio with an appealing clarity. The 40-inch 2.1 sound bar system provides three HDMI inputs and is Bluetooth enabled making this unit a convenient hub for playing back multiple audio sources both wired and wireless.